Birth control pills are a highly effective means of preventing pregnancy and maintaining a normal, patterned menstrual cycle. Taking your pills at the same time each day prevents you from missing one or more pills and, subsequently, increasing the risk of pregnancy. Planning a birth control schedule is the ideal solution, but it can take weeks to fully integrate the birth control pill into an everyday routine. Choose a particularly memorable time each day to take your birth control pill. If you take a multivitamin or prescription medication in the morning, add your birth control pill to reduce the likelihood of missing a dose. Birth control pills can be taken at any time of day, so pick a time that fits well within your daily routine without changing the routine. Many women find remembering to take birth control pills easier when they place the birth control pill package in a location they visit daily. Do not hide the package because there will be times when life is moving at hyper speed and you will undoubtedly forget to look in the hidden location when life is out of control. Keeping your birth control pack next to the coffee pot, morning face cream or your contact lenses case are perfect solutions. 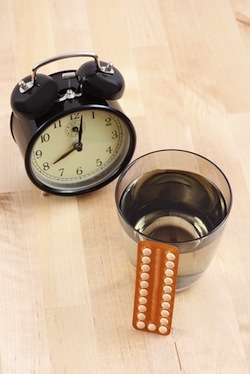 If you have chosen to take your birth control pill with your afternoon coffee and you stop taking an afternoon coffee break, change the time when you take your birth control pill to mirror that routine change. Choose your lunch break, morning coffee or evening glass of iced tea; as long as the time you choose is a definitive part of your daily routine you are more apt to remember to take your birth control pill. Routines and habits change, but you need to remember to take your birth control pill at the same time each day for optimal effectiveness. Adding your birth control to an established routine is easier than choosing a unique time of day to take your birth control pill. Always keep your birth control pill pack out in the open and change your schedule as needed to mirror changes in your daily routine. Birth control pills should not be a burden, just an accessory to an established daily routine.